At the risk of starting a religious war, Opera lets you bookmark into folders, and when you click on the folder one of the options is “open all”. Much faster, and it’s built-in. I have a “Morning Papers” folder, and a “Daily” folder (inside that are subfolders “Monday”, etc., ). one click and I’m on my way. I think my computer would have a heart attack if they were all opened at once. This is a long-time favorite, although as many readers highlighted, Firefox will often decide to kill your computer if you open too many tabs at once. I combine this activity with the Tab Mix Plus add-on, which has a feature that highlights “unread” tabs that have finished loading. So you sit back, watch the tabs go nuts and then go visit them one by one when they’re done. You forget that you can use Sessions in Opera. File -> Sessions -> Save Session en voila, all your tabes (and windows) are saved. Nice thing about it is that you chose to start with them. This is really handy for people who use allot of web based applications. Or you could try out the FireFox2 Plugin called Linkwad. You had me at Ctrl-T. I heart this shortcut alone. Many thanks! Seriously, I feel 10% more productive now! Don’t forget if it’s sites you look at really regularly, you can have multiple sites as your home page too. 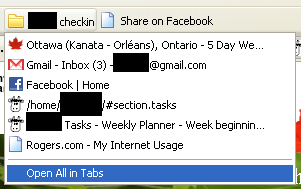 I just press home to open facebook, todoist and email all at once. that’s in firefox, by the way. OMG I totally do this! I figured it out on my own when I foolishly thought I’d try to do one hour of internet a day. I had to do everything at once, right? I have a folder named “morning” that I open with my coffee. It’s got my bank, my library, my reader, my email, my news paper, and sundry other little things I have to keep track of. Jesus… If I have known this before, I’d totally have used it ! What I do right now though, is Session Manager for Firefox. With that extension I can simply close Firefox and the tool will save all open tabs for me and reopen them upon next session. Very reliable even when something goes wrong. 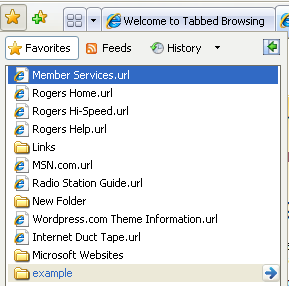 You could always install the firefox plugin Morning Coffee which will let you setup different tabs to open with one click or setup different tabs for each day of the week to open. There us a firefox plugin called morning coffee that does this perfectly. I didn’t know that it’s possible to bookmark all tabs. Now I can easily organized all sites that I usually visit. Also, I need to avoid long list of bookmarks saved on my FF.